Today, acquiring and owning Bitcoin plus many other cryptocurrencies is easier and safer than ever before - thanks to new Cold Storage Coins™. While online hot wallets can be hacked, Cold Storage Coins™are offline and hack-proof. Many people agree Bitcoin is risky business. Sure, we’ve all heard those inspiring stories about folks winning big with Bitcoin, and becoming overnight millionaires. But equally, we’re well aware of the stories of those who lose their digital fortune to theft, acts of God, or general carelessness. And between highly volatile markets, opportunistic hackers, and general human error, it’s not surprising to hear people say, “It’s just not worth the effort”. But today, acquiring & owning Bitcoin & cryptocurrencies is easier & safer than ever before - thanks to Cold Storage Coins. 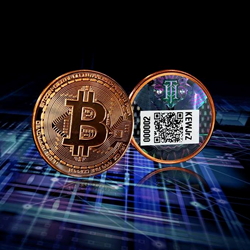 Created by the same team that brought you the iconic 2011 bitcoin commemorative, Cold Storage Coins™ are cutting-edge technology that store digital currency with remarkable levels of security and accessibility. The Copper, Silver and Gold coins mitigate common risks associated with storing crypto currencies, and make buying and trading effortless, for everyone. While online hot wallets can be hacked, Cold Storage Coins™are offline and hack-proof. And unlike paper wallets, Cold Storage Coins™are made from noble metals, making them flood and corrosion-proof, house-fire safe & inherently valuable. Even in a crypto-apocalypse, Cold Storage Coin owners still have something to hold. However, the risk reduction doesn’t stop there. When someone loses their private key, they lose their entire crypto stash. It happens often; an estimated 25% of all Bitcoin issued to date is inaccessible due to lost keys. But Cold Storage Coins™are laser etched with private keys, guaranteed to retain the data through floods & house fires. And being made from metal, Cold Storage Coins are less likely to be thrown away like paper or defunct computer hardware. And unlike digital storage devices, they’re safe from the inevitable computer and electronic malfunction. As for ease of use, each coin is also laser etched with a unique QR code. Buying & selling are as simple as scanning with your mobile device. Everything is tamper-proof, foil sealed by the global leaders in banknote security. For investments large and small, for the tech-savvy and computer novice, Cold Storage Coins are the easiest way to own bitcoin. Cold Storage Coins™ launch February 22nd 2018. ColdStorageCoins.com is brought to you by Rearden Metals Pte. Ltd. - a world-leading precious metals fabricator. From our main office in Singapore, and our satellite offices in Thailand, America & Australia, our team designs, manufactures & markets the finest collection of coins & collectibles. We blend riveting art & investment grade precious metals, resulting in beautiful collectibles that span the gap between intrinsic value and aesthetic appeal. Our team's passion for outstanding design and superior quality are the keys to how we achieve such spectacular results.